infernity is the recent hot-topic and i see many are discussing about its gayness and at the same time how to stop it. if we take a closer look, we will realize that the above combo involves a series of chains or links in order to succeed and swarm the field with trishula or the like. 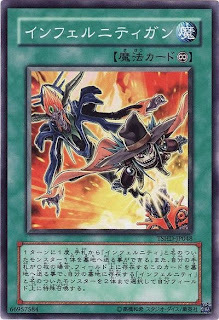 the chain/link will be something like: send gun, special summon necromancer and beetle, necromancer effect, special summon infernity archfiend, infernity archfiend effect take infernity gun from deck and add to hand and the process repeats again and again till you have drawn all the infernity guns in your deck. now, since we know that the combo revolves around these cards, it is extremely vulnerable when one of the links break, and the combo will be stopped. Effect: Once per turn, you can send 1 "Infernity" monster from your hand to the graveyard. If there are no cards in your hand, you can send this card to the graveyard to select up to 2 "Infernity" monster(s) in your graveyard and special summon them. At first glance, many will be saying that since the combo requires the player to have zero card in hand, the combo will break when the player has 1 more or handsize. however, is this really so? let us now think deeper, and relook at the card again. noting that it has 2 effects.notice that? while many advocates the use of compulsory evacuation device to stop this combo, i strongly advice not so. imagine a scenario, opponent has zero cards in hand. he now activates infernity gun, and you chain compulsory evacuation device, " jump" back his only monster on field back to hand. what you opponent can now do is to activate the first effect, send one infernity monster to graveyard and start the loop while he cleared one of your backrows. yes, you can argue that it may be that dark grepher or arm knight that you are returning. but dont forget about your opponent's chance to normal summon, furthermore, on average only a total of 3 cards(dark grepher and arm knight) are played. i'm taking reference from the recent champion posted on shriek. needless to say about returning that magic and trap, your opponent can simply set again.